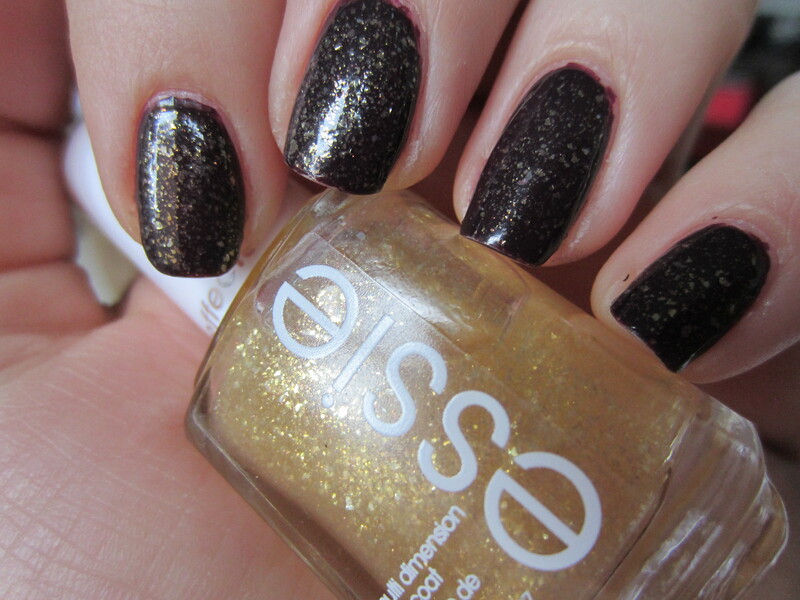 When I saw the promotional materials for Essies LuxEffects Collection, I was in love. Y’all know I love my glitter and sparkle on my nails so when there is a collection that is completely devoted to glitter top coats, flakies and sheer shimmers to make your polishes duochrome-y, that immediately jumped up to the top of my wish list. LuxEffects consists of a chunky pink glitter, chunky silver, a opalescent flaky, a pearl sheer shimmer and a gold flaky. Needless to say, I wanted all of them. I finally tracked down a display the other day at a grocery store (yeah, I was shocked that there was Essie next to the cereal aisle) and lucky for me I was wearing a nice deep red so I broke all the rules and tested out a few of them on my nails. After trying out the 5 colors and my 5 fingers, I had to have the gold flaky. Essie “As Gold As It Gets” is a clear base that is tightly packed with super fine gold flakes that are all different dimensions. I suspect that you might be able to get this completely opaque in about 10 coats but this goes amazing layered over any color. This is layered for OPI “Honk If You Love OPI” (and if you want to see it on its own you can click here for my post on it), and in my opinion it looks so rich and sophisticated. But I’m so in love with this polish that I tried layering it over white on my toes. I’m not going to subject anyone to see my toes but it looks just as good over white that it does over deep purple. This just adds a level of luxury to any ordinary manicure because it looks like you’re adding gold leaf to your nails! This is gold leaf in a bottle and I can’t wait to experiment with it!